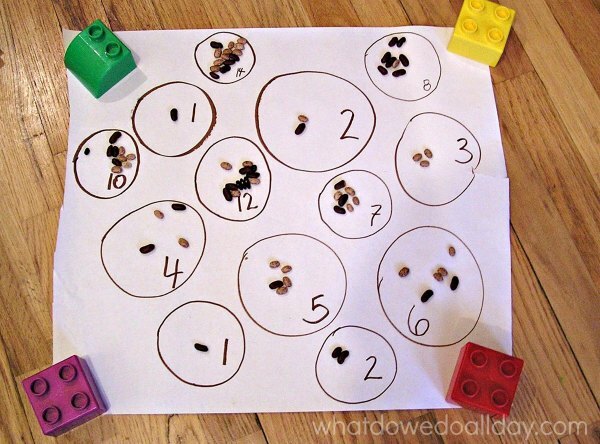 This was such an easy math counting idea to put together and my son absolutely loved it. Maybe more than he should have for a 3 year old! I love that it also worked his fine motor skills. Picking up tiny beans can be tricky work! Kiddo is totally obsessed with numbers and counting. I don’t actually know what the average 3 year old’s knowledge of numbers is but Kiddo can easily count into the hundreds. How it happened, who knows; I don’t remember actively teaching the numbers but I must have, somehow. First we drew six circles. I didn’t care if they were perfect or in a straight line or any of that. The important part is to get to the counting part as quickly as possible. I asked Kiddo for a few numbers and he choose 1-6 (he’s very organized). Then I explained Kiddo could put the same number of beans in the circle as the number. He got extremely excited at this idea. Could. Not. Wait. After he finished, I drew more circles and encouraged Kiddo to choose different numbers. We’ve done a similar counting with pom poms activity. Or, if your child is ready to count too 100, you could try a a similar activity with popcorn. You could easily modify this to teach the concepts of less and more or simple addition. We stuck with simple counting for the day. WOW! Your kid sounds smart!